Owing to the national and international standardization process, the KKS Identification System for Power Stations (hereinafter referred to as “KKS”) is being replaced by the RDS-PP® Reference Designation System for Power Plants based on DIN ISO 81346-10. Thus, RDS-PP® is thus considered to be a generally accepted good engineering practice and can be applied in planning, construction, operation and dismantling of energy supply plants and equipment as a an unambiguous identification system. Existing power plants with identification coding to KKS will not be re-coded to RDS-PP®. Consequently, it will be necessary to continue to apply the KKS system in the event of additions to existing plants and conversion measures, I&C retrofits etc. Technical progress made over time called for adjustments to the KKS rules. Some examples were added to the KKS guidelines and the KKS keys were updated. The examples given in the KKS guidelines are intended only for explanation of the defined rules. The KKS Rules as a code of practice consist of the KKS Guidelines and the KKS Keys. The Application Explanations (VGB-B 106e parts A, B1, B2, B3 and B4 covering general application, mechanical engineering, civil engineering, electrical engineering and process control and instrumentation, 2004) and the Equipment Unit Code and Component Code Reference (VGB-B 105.1, 1989) are not updated any more. 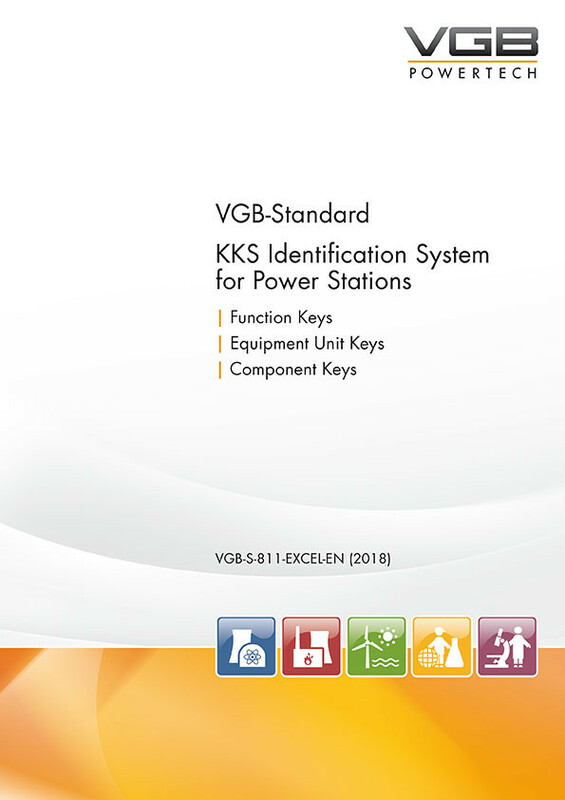 KKS Identification System for Power Stations: The VGB-Standard VGB-S-811-01-2018-01-EN "KKS Identification System for Power Stations. KKS Standard and Key Part" is completed by VGB-B 106e "KKS Application Explanations: Parts A, B1–B4" and VGB-B 105.1 "KKS Begriffszuordnungsliste zum Aggregate- und Betriebsmittelschlüssel". The current edition of the "KKS Identification System for Power Stations" is the VGB-Standard "VGB-S-811-01-2018-01-EN", For existing installations the VGB-B 105e may be applicable. Key Part (Excel): The Key Part consists of the Function Keys, Equipment Unit Keys, and Component Keys. A license agreement for application, e.g. in digital systems, or passing on or selling of contents to third parties is mandatory. The works and their application are licensed during the Ordinary Membership in VGB Power e.V. (https://www.vgb.org/en/vgbvs4om.html). Important notice: Any further use, e.g. in publications or digital systems, requires a separate license agreement with VGB PowerTech. Please contact us at mark@vgb.org.